Founding Father, inventor, politician, diplomat, scientist, and author: Benjamin Franklin is one of American history’s most significant figures. Even a cursory look at his career reveals groundbreaking accomplishments. However, Franklin’s success didn’t come without challenge, mistakes, and in a few cases failures. Founding Father, inventor, politician, diplomat, scientist, and author: Benjamin Franklin is one of American history’s most significant figures. Even a cursory look at his career reveals groundbreaking accomplishments. For one, Franklin heavily influenced both the Declaration of Independence and the United States Constitution. He also proved that lightning was electrical, which helped him to invent the world’s first lightning rod. He even invented bifocals, his own versions of a stove and odometer, and a urinary catheter. However, as his quote above reveals, Franklin’s success didn’t come without challenge, mistakes, and in a few cases failure. In fact, some of his first attempts at inventions needed revision, his political proposals weren’t always enacted, he dropped out of school at a very young age, and he was seriously electrocuted during one of his famous experiments. But with hard work, tenacity, and a spirit of curiosity, Franklin bounced back after every obstacle and became one of history’s great renaissance men. One of Benjamin Franklin’s early milestones was publishing the first German-language newspaper in the United States, Die Philadelphische Zeitung, in 1732. While novel, the publication failed to gain a following and went out of press less than one year later. Another of Franklin’s early publications, The General Magazine and Historical Chronicle, also failed after just six issues. But these failures meant almost nothing in the long run. Ultimately, Franklin became a hugely successful writer, editor, and printer with the Pennsylvania Chronicle, The Pennsylvania Gazette, and his immensely popular editions of Poor Richard’s Almanack. Interestingly, Benjamin Franklin believed that the Standard English alphabet needed a bit of reform. His proposed new alphabet, known as the Photonic Alphabet, eliminated letters like C, Q, and W that he believed were unnecessary. He also thought up six new letters to replace sounds that require multiple letters – for example, the sounds “th” and “sh.” According to Franklin, this new alphabet would have created a more natural sounding mode of spelling that prioritizes sounds created in one’s windpipe or breath. Though Franklin’s Photonic Alphabet was at least partially supported by America’s most famous lexicographer, Noah Webster, the idea never even came close to taking off. It was considered too radical and Franklin ultimately scrapped the proposal entirely. 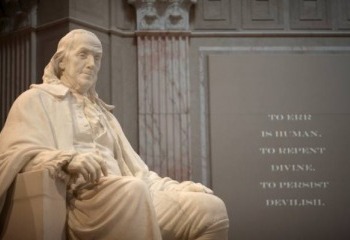 Nonetheless, Franklin’s idea was certainly intriguing and you can learn more by checking out the Smithsonian’s excellent overview of the proposal and its history.